Adults and children over 12 years: swallow 1-2 capsules a day, preferably with a meal. Flaxseed oil, capsule shell (starch, sorbitol, maltitol, glycerol, emulsifier: glyceryl monostearate), sunflower oil, pumpkinseed oil, wheatgerm oil (from wheat), vitamin E, evening primrose oil, rosemary oil, soya lecithin (from soya), rice bran oil. Omega3+6+9 oil blend 500mg providing Alpha-Linolenic Acid 200mg, Linoleic Acid 100mg, Oleic Acid 100mg, Palmitic Acid 15mg, Stearic Acid 15mg; Vitamin E 10mg. Women who are pregnant or planning a pregnancy should not take any nutritional supplements without first consulting their doctor or clininc. 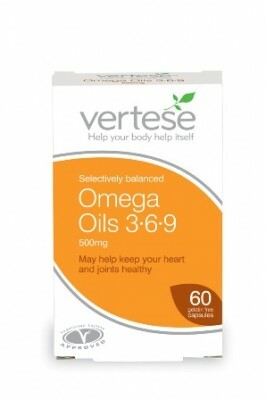 Click the button below to add the Vertese Gelatin Free Omega Oils 3+6+9 500mg 60 capsules to your wish list.